AmbyBurfoot.com: Coach Jeff Billing and the Hall High "coaches' challenge"
Coach Jeff Billing and the Hall High "coaches' challenge"
Jeff has a better way. 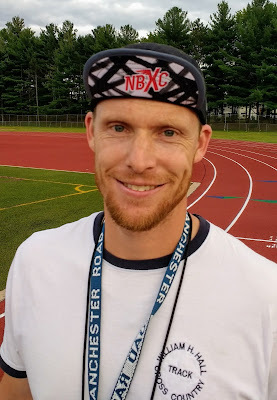 By "Jeff," I mean Jeff Billing, the cross-country coach at Hall High School in West Hartford, Connecticut. (Who also happens to be my nephew.) By “better way,” I’m referring to the pre-season time trial that thousands of high-school coaches use to kick off the fall season. No doubt, the time-trial represents a long and honored tradition. Still, it has limitations. “A lot of the runners, especially the young ones, go out way too fast and blow up,” Jeff notes. “That means it’s not a good gauge of their fitness, or how to plan their training. Plus, it’s so demoralizing to the ones in the back. How can anyone pretend it’s a positive race experience for them? Jeff calls his better way the “coaches' challenge.” Basically, it amounts to a series of controlled-pace 3200-meter races on the track, with each runner placed in an appropriate heat. Special guests and alums are invited to pace each group. They alone are given the goal time selected by Jeff and the other Hall coaches. None of the high school runners knows what the pace will be, and they are not allowed to wear a watch. Hall runners chase Ev Hackett at beginning of last lap. They are also told they can run the last lap as fast as they want. But until then, they must stay behind the pacer. No exceptions. My comment elicited no responses. Not even a changed expression. I scanned the kids’ faces. They looked pale and slightly frightened. “Most of them have probably never run a race of any kind before,” Jeff had told me earlier. Before we continue, a few more words about my nephew. Jeff graduated from MIT 15 years ago with a masters degree in artificial intelligence. He quickly inked a signing bonus with one of those famous Silicon Valley outfits. Jeff lasted two years in the big-brain world. It wasn’t that he couldn’t do the work. He just didn’t give a damn. It was so … un-fun and un-fulfilling. Jeff wasn’t born to write code. He was born to teach and coach. Jeff quit his tech job, took a 50 percent pay cut, and began teaching math and coaching sports in a public high school. He’s been at it ever since. I’m biased of course; uncles have certain rights. But if you happen to have a youngster who’s interested in math and running, I’d suggest you check out the West Hartford real-estate listings right now. The thing about Jeff is, he doesn’t match your MIT stereotype. Oh, he’s plenty quick with numbers. But it’s his smile, enthusiasm, and excitement over every life opportunity that stands out. It’s not by-chance-alone that Hall has 120 runners (and growing) in its cross-country program. This is genuine cause-and-effect. The kids love being on Jeff’s teams, as much as he loves figuring out the right pace, training, and year-over-year progression for them. Yes, the MIT math proves helpful. Heat 1 is led by sub-1:05 half-marathoner Everett Hackett, an assistant coach at Hall. 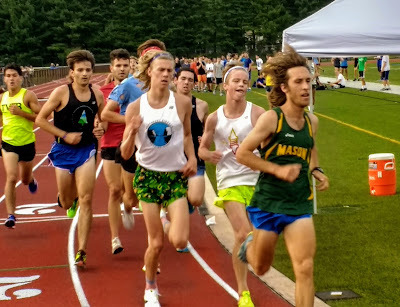 He’s joined by recent Yale grad and 3:58 miler James Randon, and about 15 high schoolers, many from a particularly talented Hall junior class. Two years earlier, at the 2015 coaches’ challenge, several of these runners, then freshman, had finished in 11:10. At the end of lap seven, several Hall runners surge past Hackett with impressive sprints. They can’t hold him off the whole way to the tape, nor Landon, but they run in the low 60s for their final 400, finishing in 9:51 and 9:53. Hall’s sixth runner clocks a 10:07, the ninth runner, a 10:17. In heat 9, I take the inside lane, and set out on our appointed rounds, anxiously checking my wristwatch every 100 meters or so. How long has it been since I’ve run a track race? At least 10 years. My brother, 68, runs at my side. “A little too fast,” he says at the mile. But we’ve clocked a 7:55, close enough. The next three laps, I’m aware of two things. First, there’s a kid practically bumping shoulders with us who is running way over his head. His breath sounds deep and raspy. “I’m done,” he says suddenly on the sixth lap, collapsing to the infield. Second, I’m working hard while some of the ninth-graders a stride back appear to be going easy. On the last lap, a handful of them blast around my brother and me. We had been running roughly 120 seconds per lap, but they cover the final 400 in 80 seconds. My brother hits 93. I stagger to the finish with a 110 for the last 400, and 15:45 for the two miles. Heat 11 is led by an Olympian … or the next closest thing. Sixty-two year old Betty Remigino, recently retired as athletic director at Hall, carries a last name that’s much revered around Hartford. 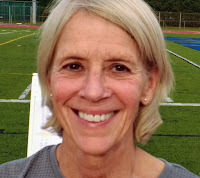 In 1952, her father, Lindy Remigino, won the Olympic 100-meters. Betty’s no slouch herself, easily running 9:00 pace to lead her group. That seems possible. The huge space--football field, track, bleachers, and surrounding soccer fields--has gone completely still. There’s not a word, whisper, or rustle.